"This recipe uses light ingredients, but it still comes out moist with a mild sweetness. Great to make if you don't feel like waiting hours for traditional yeast bread, but are craving some." Preheat oven to 375 degrees F (190 degrees C). Grease a 5x9 inch loaf pan. In a bowl, mix the milk, yogurt, egg, maple syrup, and lemon juice. In a separate bowl, mix the flour, baking soda, cinnamon, and nutmeg. Gradually stir the flour mixture into the milk mixture until moistened. Pour into the prepared loaf pan. Bake 50 minutes in the preheated oven, or until a knife inserted in the center comes out clean. 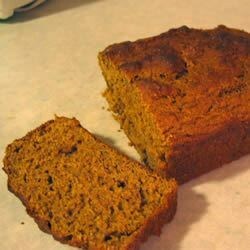 Wow I was surprised how amazing this recipe was with whole wheat flour. I made them into muffins instead of loaf pans. Kids ate them up! I followed all the directions, but I found it bland (despite increasing the spices). I wish I hadn't wasted expensive syrup. I won't make this again.